See Below our for the.. The Hanna range of quality instruments are manufactured to the highest standards, with excellent accuracy and a first class back up and support service. It makes Hanna the choice of professionals all over the World. 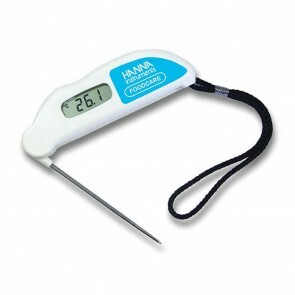 The Hanna Shop on the Thermometer Superstore website contains a range of thermometers and pH meters produced by one of the World's leading scientific instrument manufacturers - Hanna. Hanna was formed in 1978. They manufacture all their own instruments and have 56 sales and technical support offices in 35 countries. A purpose-built, state-of-the-art production centre in Romania is supported by two development centres in the USA and Romania. Manufactured to provide long and reliable service, our Hanna range includes thermometers with Hanna's Cal Check function in which the instrument is able to perform a calibration check without the need for buying separate test caps/plugs. Hanna Instruments has a reputation for research, development and innovation and their commitment to produce quality products at competitive prices is evident throughout the range. At one end of the scale we offer simple to use pocket instruments, with large easy to read displays and yet still offering the Hanna Cal check function mentioned above. At the other end of the scale are high-end professional thermometer designed for tough environments. In addition to the Cal check function, they are dust and waterproof to IP67 standards and will accept a wide range of probes and sensors. With accuracy levels that exceed those required by food safety legislation and smooth, moulded ergonomic cases that reduce any areas where food might become trapped, these easy to clean instruments are perfect for the most demanding enviornments.